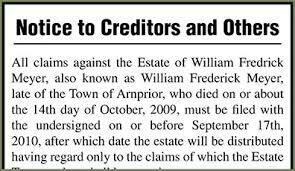 How Long May a Creditor Assert a Claim After Someone Dies? A creditor may file a claim within two years from the date of death of a decedent. After two years, all creditor claims are barred. During such two year period, a personal representative may take action to shorten the time in which a creditor may file a claim against a decedent’s estate. Traditionally, such action was taken in the form of publication of a notice to creditors. Now, however, a personal representative must take steps to locate and notice all reasonably ascertainable creditors of a decedent. It is important to note that a creditor may only be paid back to the extent a decedent leaves assets in his name alone. Therefore, when a married couple owns all of their assets jointly as husband and wife, the surviving spouse will immediately inherit those assets by virtue of their joint ownership. The deceased spouse no longer has assets, or an “estate”, available to pay creditors. If the decedent passed away owing individual credit card debt, or after incurring medical bills, creditors cannot force the surviving spouse to pay those debts as the assets of the deceased spouse are now owned by the surviving spouse. asset must be transferred in probate court. Before distribution, creditors are entitled to notice of the probate proceedings and creditors may file a claim for payment. A personal representative is required to publish a “notice to creditors” in a local publication where the probate is pending. This publication begins a creditor claim period wherein a creditor has 3 months from the first date of publication to file a claim in the estate. Additionally, Florida law requires a personal representative to “promptly serve a copy of the notice” on creditors which are reasonably known to the personal representative or reasonably ascertainable after diligent search. The copy of the notice is served by certified mail. If a creditor receives the notice, the p eriod in which a creditor may file a claim becomes either 30 days from the date of service of the notice, or 3 months from the first date of publication, whichever is later. Florida law states that it is the personal representative’s responsibility to make diligent search and to notify all known or reasonably ascertainable creditors. 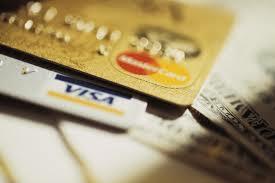 Such creditors are entitled to personal service of the notice to creditors by certified mail. The first and second district courts of appeal have held that a creditor, whether or not reasonably known, who did not file its claim within 3 months from the first date of publication, is barred from filing a claim. The court reasoned that a creditor is required to file its claim within the 3 month period following the first date of publication, if not served with personal notice, which changes the filing deadline to 30 days or 3 months from the first date of publication, whichever is later. Seemingly, the purpose of the publication is to provide public notice of the pending probate administration and to instruct a creditor where to file its claim. Publication provided a safeguard for a personal representative to pay creditors, make distribution, and close an estate, without waiting a full two years to ensure all creditors have an opportunity to file claims. 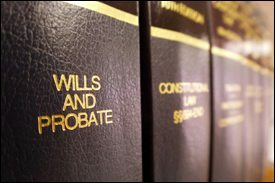 In fact, many probate practitioners advise clients to open a probate even when assets do not need to be transferred, (i.e. when there is a trust), merely to publish a notice to creditors and “shorten” the creditor claim period. However, the fourth district court has held that a reasonably known creditor is entitled to service of the notice to creditors, and absent service of notice, a creditor may file its claim at any time, as long as it is not barred by the two year statute of limitations. The court cited due process concerns for the creditor and reasoned that the plain language of the statute allows a reasonably ascertainable creditor 30 days to file a claim after service of notice. Therefore, the issue becomes whether the creditor is reasonably ascertainable to the personal representative. If reasonably ascertainable, it is the duty of the personal representative to serve such creditor the notice to creditors. If a reasonably ascertainable creditor is never served, the applicable limitations period never begins to run, and the creditor’s claim may only be barred if not filed within two years. In October 2015, the Supreme Court of Florida certified conflict on this question, and held that claims of known or reasonably ascertainable creditors of an estate who were not served with a copy of the notice to creditors are timely filed, if filed within two years from the date of death of the decedent. The Supreme Court followed the reasoning of the fourth district court, finding that its interpretation is in accord with the plain language of the statute and the requirements of due process. Further, the Supreme Court of Florida cited the United States Supreme Court, which has held that where a creditor is known or reasonably ascertainable, but not served with a notice to creditors, the claim cannot be barred by publication. To conclude, a personal representative cannot rely on publication to shorten the time period for a known or reasonably ascertainable creditor to file a claim. The onus is on the personal representative to make diligent search of all known or reasonably ascertainable creditors of a decedent and the personal representative must provide such information to his or her attorney for personal service of the notice to creditors. The cautious personal representative may wish to wait a full two years before distribution to ensure that there will not be any creditor issues, but beneficiaries are often anxious for distribution and may not be content with waiting two years. The personal representative should also bear in mind that theFlorida Probate Rules require a personal representative to file a petition for discharge within 12 months from the date of the issuance of letters of administration, unless the time is extended by the court for cause. Therefore, rather than waiting a full two years to distribute, the personal representative instead should seek the best strategies for obtaining all creditor information for the estate. It is a delicate balance to please beneficiaries, efficiently administer an estate, and ensure all creditors have received proper notice.